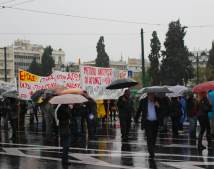 Members of the public service union ADEDY joined general strikes across Greece to protest the “troika’s” measures, including an austerity plan that features decreased public sector spending and personnel cuts. Schools closed Wednesday as teachers left their classrooms, Parliament halted as lawyers, too, joined the strike. Most public transportation stilled and the airport runways were deserted for a time as air traffic controllers voiced their opposition to these great assaults on economic justice in the global birthplace of political freedom. Labor journalists and communication strategists have come together in Athens this week as part of Public Services International (PSI) initiative to document the effects of forced austerity measures on the Greek people, and the trade union and community resistance. Rosa Pavanelli, General Secretary of PSI, described why public sector unions across the globe are supporting these efforts.